When I saw Karlito being carried ever so perfectly down the runway by Cara Delevingne, I knew I had to have him. At first I was told the kitschy bag charm wasn't intended for product, but with many others like me pining for our very own Karlitos, Fendi decided to make the little guy after all. Then came trying to track one down, which was hard because all of NYC was sold out and the waitlists were long. Since I knew I was moving down to Florida, I called up the Bal Harbour Fendi boutique and ended up talking to the manager, who was lovely and told me they weren't sold out of spots! I pre-ordered Karlito and couldn't wait for him to arrive. Since his arrival, Karlito has made a place for himself and taken his own journey. There will be many more photos to follow, but for now, take a peek at what it's like for the #LifeofKarlito (and yes I made a hashtag on Instagram and you should totally follow along!). "People can drink with their eyes; I can eat with my nose." "I like to do things quickly because I'm easily bored." "I don't know what 'normal' means, anyway." "Black-and-white always looks modern, whatever that word means." "I don't want to look sloppy, because then I feel sloppy." "Vanity is the healthiest thing in life." "I don't want to be on the Internet." My oh my, we’re assuming that by this time you are already familiar with Karlito. Err, for those who couldn’t remember just think of two words: Karl Lagerfeld. Now, does that name ring a bell? 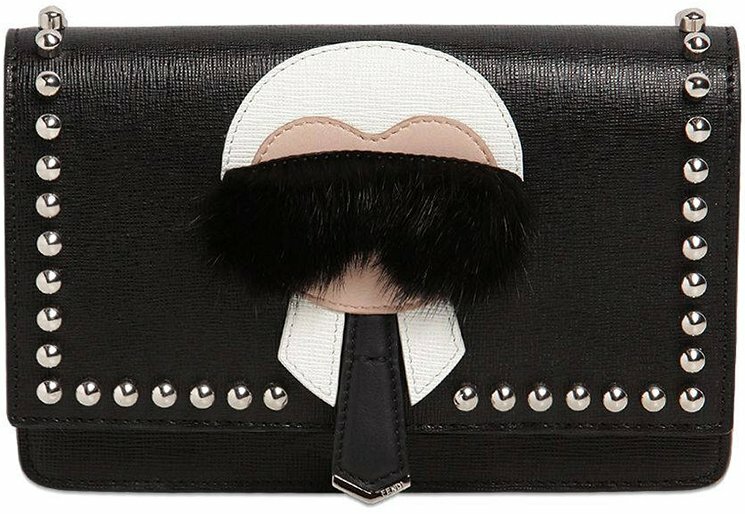 Let’s talk about the Karlito Wallets, these are creation from Karl Lagerfeld’s own brand: Karl Lagerfeld. The wallets look aesthetically pleasing to our eyes, mind you, they are cute without a doubt. I mean, who couldn’t resist that adorable man in his tie and that black mustache of him sticking out of the wallet, for the whole world to see? Aside from the dainty man in tie logo, we are also raving about the studded details on this wallet! It makes it look extra polished and stylish. The black color is also a true of sophistication. Priced at €830 euro. Are you looking for a funky and edgy bag that will add personality to your style? 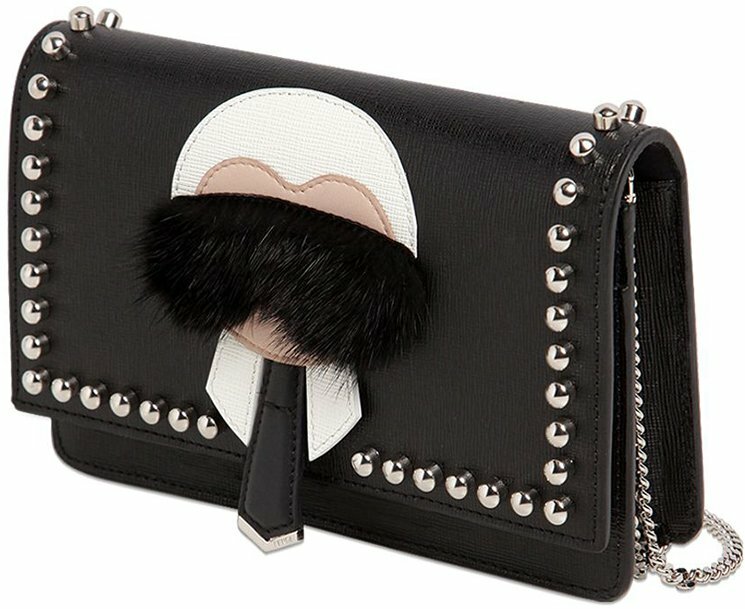 Look no further as Fendi’s Karlito fur-trimmed leather shoulder bag might be the perfect fix and pick-me-upper. Filled with nothing but cheeky, tickled-pink cuteness, the signature Karlito shoulder bag is one bag accessory that should be a part of your bag collection. Upon seeing it on the stand, one word surged through our minds: kawaii (which is a Japanese word for describing the quality of being cute). 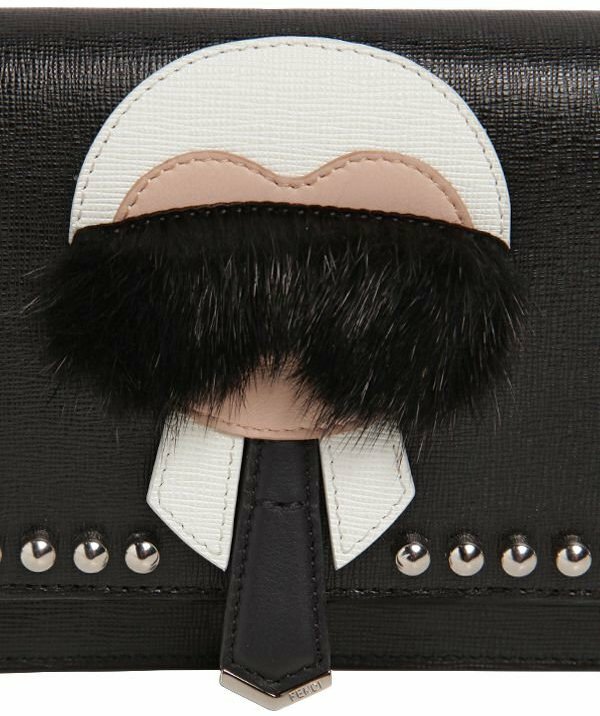 The fresh cream-colored leather bag is given a glam and darling effect with a mink fur-trimmed tribute to Karl Lagerfeld. Just look at that cute man design on the front and you’ll surely notice that it’s dear old Karl. 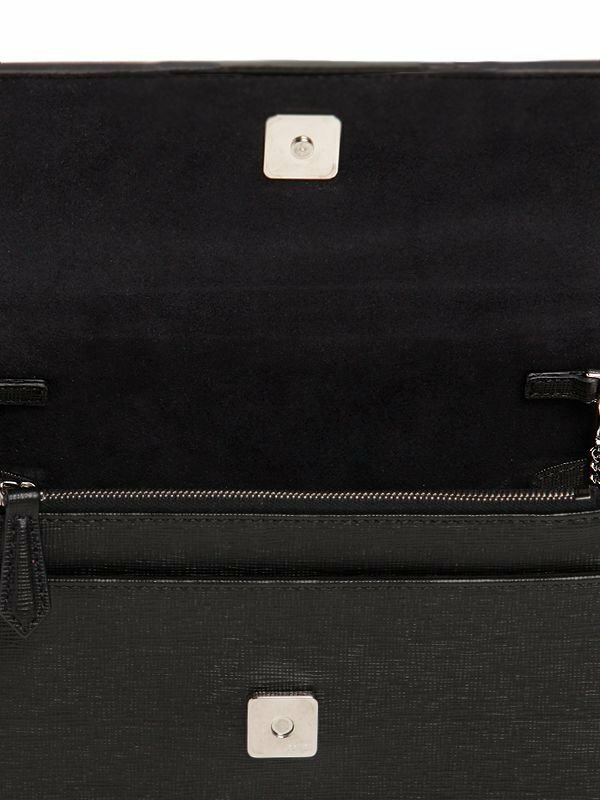 It has the following descriptions: detachable chain shoulder strap, magnetic fastening, fabric lining, front slot pocket, zipped pocket, six card slots, calf leather, mink fur, and is made in Italy. Measuring: 12 x 19 x 4 cm (H x W x D), priced at $1600 USD or €1200 euro. Fans of anything Karlito, take note. Due out next week in Singapore is Fendi’s Karlito Capsule collection, one that’s also dedicated to Karl Lagerfeld. Comprised of many other items besides the now-famous key rings that bear his iconic profile, you’ll find everything from RTW (sweaters and jeans) to bags (backpacks and totes) and even sneakers that come complete with a ball of fur and his trademarked black tie. Available in limited quantities from 20 May, prices start from SGD790 for the iPhone6case (shown above), to SGD6410 for an elaborate studded backpack that’s quite a sight to behold. Other pieces, from the sweatshirt to the tote bag and the Mini Karlitokey ring are priced at SGD2390, SGD5180 and SGD1580 respectively. In other words, it’s time to head down to Fendi at either Marina Bay Sands or Ngee Ann City to put yourself on the wait list. Or just head over to my Facebook page first for a look at everything that will be available.